ScandMedia joins Mynewsdesk Asia networking event | Scand-Media Corp., Ltd.
Scandinavian Publishing participated on Wednesday 3 June 2015 in a regional networking event held by Mynewsdesk in Singapore. The event was organised by Julia Tan, Team Leader for Mynewsdesk Asia, and included agents and representatives from Japan, Indonesia, Taiwan, Thailand and Singapore. 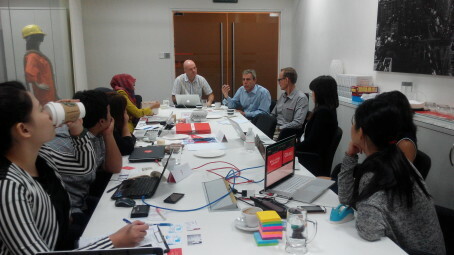 The purpose of the event was to provide training, exchange and networking among representatives of Mynewsdesk across Asia at Mynewsdesk Academy, located at NHST Media Group Asia in Singapore. From Thailand, the participants were ScandMedia’s founder and CEO Gregers Moller, Scandinavian Publishing’s Marketing Director Finn Balslev and Mynewsdesk representative Joakim Persson. The other participants were Mariko Fukui, Aalto International, Japan; Ria Aryanie, TalkLink PR, Indonesia; Libby Krisman, TalkLink PR, Indonesia; Desty Rahma Nathalia, Triad Comms, Indonesia; Ria Veronica, Triad Comms, Indonesia; Iris Pan, Asiannet, Taiwan; Shreya Shetty, Hong Bao Media, Singapore and Mark Yeow, Text100, Singapore as well as Scott Andrew, Marketing & Client Services Manager for Mynewsdesk Asia.